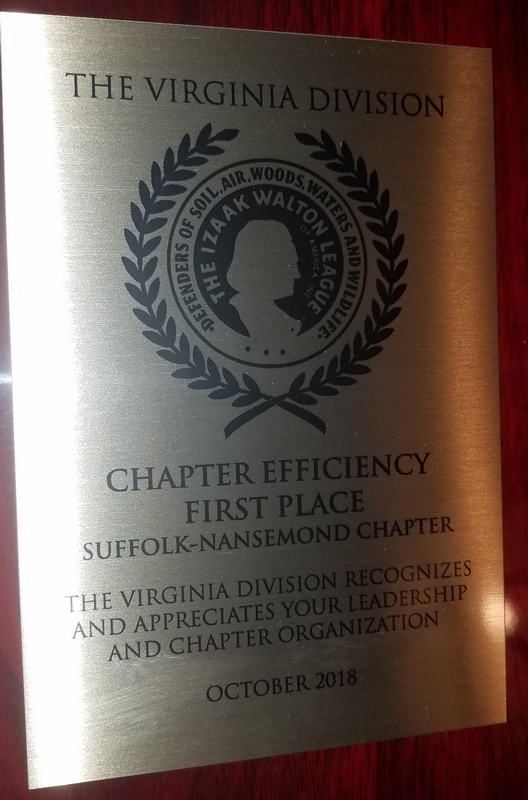 For the 5th consecutive year, our chapter has won an IWLA VA National Division award for chapter efficiency. The evaluation criteria for winning this award, according to Norm Lesham, VA Division Chair, includes attending National conventions and division meetings, the existence of balanced budgets, performance of internal audits, the timeliness/frequency of Treasurer’s reports, member participation levels in Chapter activities, a sustained or increasing membership headcount, distribution of newsletters, etc. This award is a testament to the continuing leadership, stewardship, and wisdom of our Chapter Executives and Board of Directors and work work by all our Chapter members who participate in the various activities/events we hold throughout the year. On behalf of our entire Suffolk-Nansemond IWLA Chapter membership, we thank the VA National division for this award!